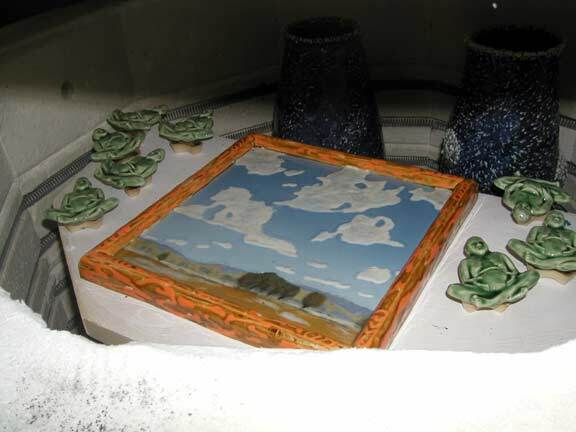 Once again, here is a peek in the kiln when it is at 800 degrees. This picture shows what will be coming down the pike in the next year or two. Remember ages ago on a past update I talked about making paintings and/or print like images on tiles that had ceramic frames- all one piece? Here is the first one. I abandoned the process because I could not get a porcelain panel with the frame to survive the firing. 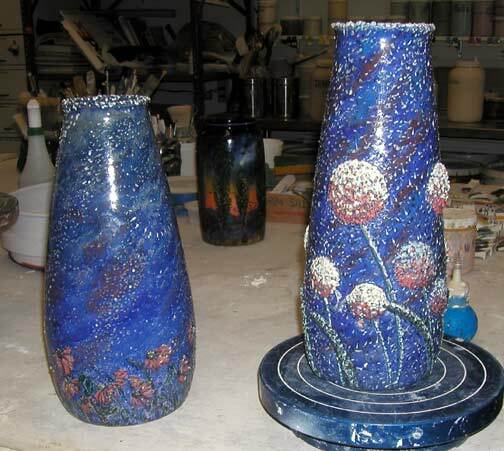 I may know how to do it and if I can, you will start to see my ceramic paintings. And no, I do not call them plaques. I don't want to "liken" them to anything made previously. I started making tile panels since I could not get the size tile with the frame that I wanted. 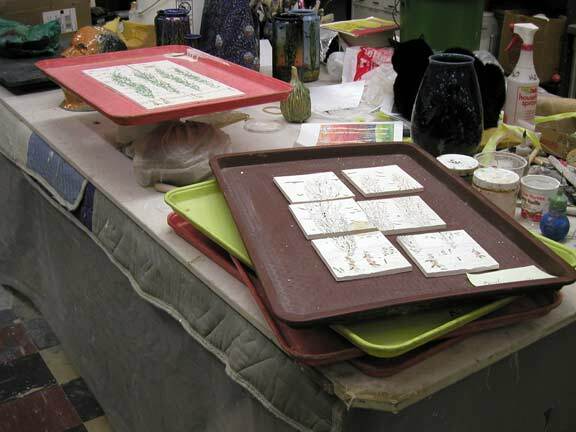 Here are five tile panels that are in that kiln that is -at this moment- at about 550 degrees. 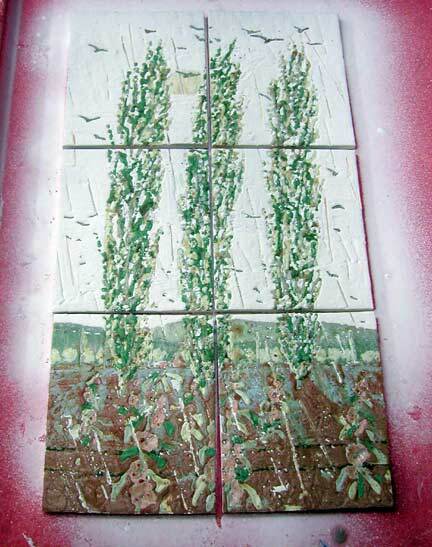 Here is one panel when it is finished being glazed and waiting to be fired. This is a dark rain scene. 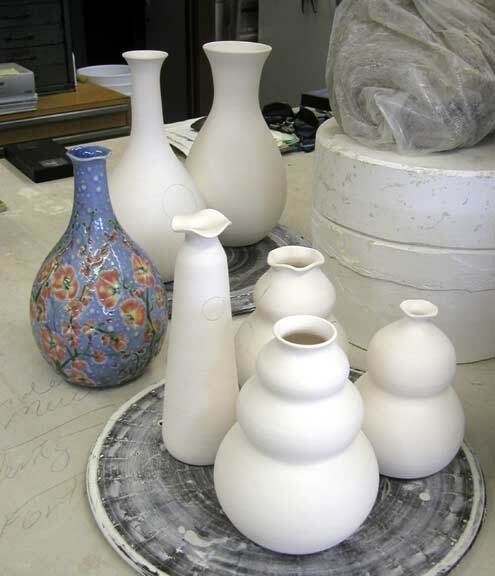 I almost always have to reglaze and refire the rain pots to get the complexity of the sky. I may have to reglaze the two rain panels. Maybe. Maybe not. I won't know until I open the kiln tomorrow morning. 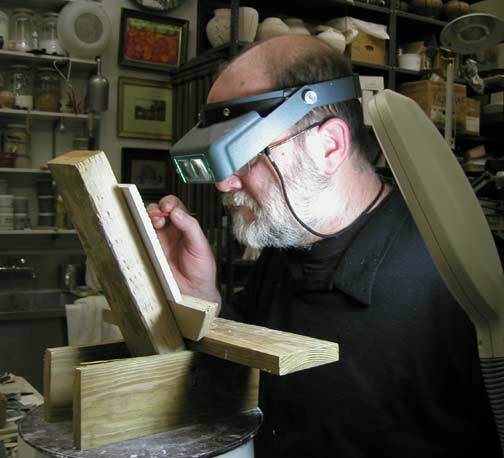 You have seen pictures of me working like this before. This is what all the poplar pots and panels need- close, close work. Will I make any of these again? Hmmmmmm. All these panels- I have about a dozen of them- are destined to get the royal treatment with the copper and silver frames. Still a long way to go before they are "available." These pots were reglazed AGAIN!- for the sixth time. You can see them in the background of the first picture on this update. 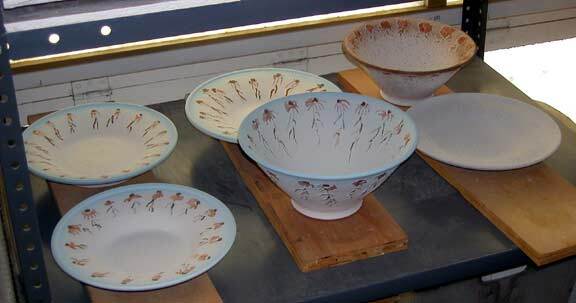 And I took a little time to glaze up my Christmas bowls. 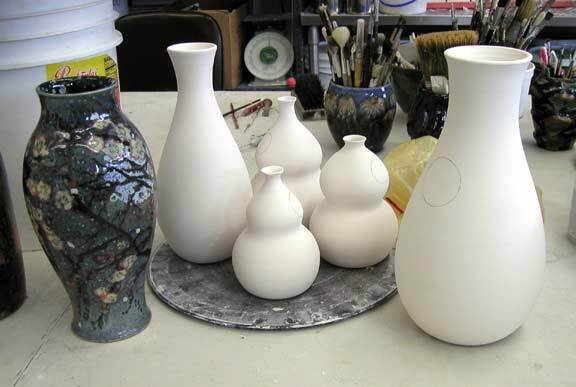 Here they are waiting for one more- the most important- glaze treatment before being ready to fire. They are also in the cooling kiln. At least I will be ahead of the game come next Christmas!! I have been making a few more of the Grape Vine Pots. They are getting a lot more treatment with a reworking of the entire surface. And here is something brand new for the A&C lover. Candlesticks that can do double duty as a bud vases. Yep, lots of influences- Teco, Tiffany, Galle etc. 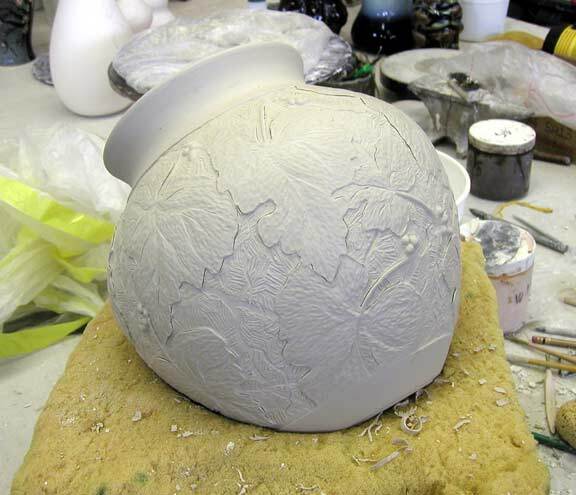 And yes, I will be glazing some in matt green! and these six will have the same title but with a daytime theme. The kiln is at 519 and I am anxious!